Be clear on your invitations when you host an adults-only reception. While many people love children, some brides and grooms might not like the idea of children running around at their formal wedding receptions. While it can be considered cold or rude to some people, if the bride and groom want to exclude children, they should make that clear from the start and be prepared for some people to grumble. The most important aspect of hosting an adults-only reception is making sure you don't come across as rude on your invitation. Talk your decision to host an adults-only wedding over extensively with your fiance. Make sure that both of you agree completely on the issue. Be prepared to explain to questioning parents why their children are being excluded, whether it is because of financial reasons or simply because you are hosting a formal reception at which you believe children would not have fun and could be a distraction. Place the line "Adults Only" on your invitation below where you are listing the reception information. Do not say "No children," as that can come off as more rude than simply "Adults Only." Discuss with your fiance whether you will have an age cutoff for children. For example, you likely will be excluding children below the age of 8 or 9. However, you might feel comfortable with allowing children over age 12, age 16 or another age. Set a cutoff so you are clear on what age groups will be allowed. Don't include this information on the actual invitation, but when you write the names on the inner envelope, include the names of older children as well as the adults. Write the names of the people you are inviting on the inner envelope of your invitation. For example, if you are inviting a couple who has children, list only the couple's name on the inner envelope. Anyone who missed the "Adults Only" line on the invitation itself will likely get the message from this. Include RSVP cards within your invitation. On the card, leave a space for your guests to list all of the people who will be coming. If someone lists her young children, you will know that you need to have a conversation with her. Do not make exceptions for some children. If a close friend has small children, they should be excluded from the reception just like those of a distant family member. Allowing some children and excluding others will appear rude to your guests. 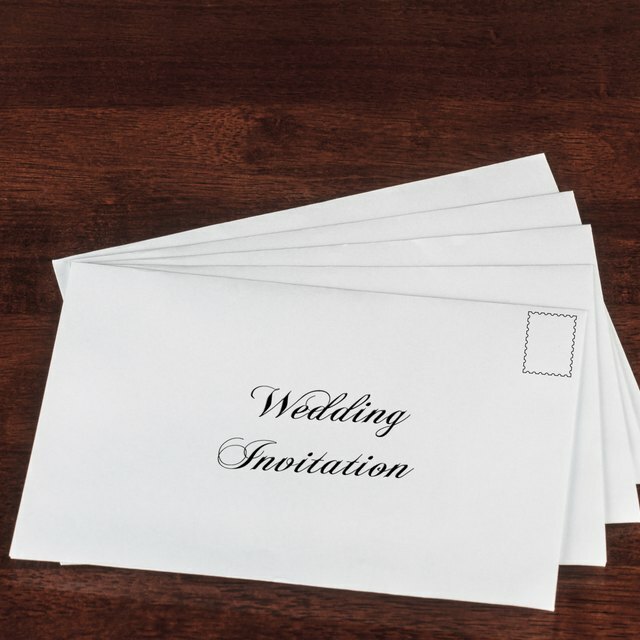 How Do You Address Wedding Invitations to the Officiating Pastor Conducting the Service? Who Gets Invited to a Wedding Rehearsal Dinner?